Two police officers were wounded in Jerusalem shortly after 1:00 pm when an Arab-driven bulldozer plowed into their vehicle. Two police officers were wounded in Jerusalem shortly after 1:00 p.m. when an Arab-driven bulldozer plowed into their vehicle. Other police officers who were patrolling nearby began firing at 26-year-old Mir'i Radeideh, as did a civilian taxi driver, "until he stopped moving," according to one of the officers who shot him. The would-be murderer was a married man with one child, a resident of the Jerusalem neighborhood of Beit Hanina, and was carrying a Palestinian Authority identification card. To see a detailed photo essay on the terror attack, click here. In addition to the raw footage above, see the Israel National News TV report on the tractor terrorist attack. According to an eyewitness, the Arab rammed the police car, flipping it over twice, and then tried to push it into the bus, which was empty at the time. He was shot as he attempted to crush other vehicles with the bulldozer. An open Koran was found in the driver's compartment, according to Jerusalem District Police Commander Nissan Shaham. Security personnel and medical first responders from Magen David Adom emergency services rushed to the scene. Paramedics treated the mortally wounded terrorist, who was then evacuated to Hadassah Ein Kerem Medical Center in the capital. The medics also treated both of the wounded police officers at the scene before they were evacuated to Shaare Tzedek and Hadassah Ein Kerem hospitals. The terrorist later died of his wounds. The two police officers are listed in good condition. Four other people were treated for severe emotional trauma. The incident occurred at a busy intersection in southern Jerusalem, where the Menachem Begin Highway meets Eliyahu Golumb Blvd., not far from Teddy Stadium and the popular Malcha Mall. 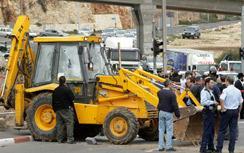 Two similar attacks using tractors or bulldozers were perpetrated by eastern Jerusalem Arabs in July 2008. In the first one, three people were murdered in their cars, while in the second one, no one was killed, though over 30 people were injured. Civilians on the scene shot and killed the terrorist in both incidents. Commander Shaham said that a list of all bulldozer owners and licensed bulldozer drivers in the greater Jerusalem metro area has been compiled following the incident, although "this is not the kind of attack we can anticipate in order to prevent in advance." The terrorist's identity was not discovered until hours later. Senior Hamas terrorist spokesman Mushir al-Masri praised the bulldozer attacker in a statement released to the media shortly after the incident. "The operation in Jerusalem was a natural response to aggression against our people. The Zionist enemy should realize that they alone bear the responsibility for displacing our people in Jerusalem and for the killings in Gaza and [Judea and Samaria]."